Email Prayer Chain list: Ever feel a little out of the loop? Would you like to be added to the email list for prayer requests? Please furnish your name & email address to Sharon in the office to add you to our list. You may also add your name to the phone prayer chain. Just let Sharon know this also. Home Bound & Care Facilities: Keith Cook, Faye Culp, Marilyn Judson, Janice Salmander, Lucille Stickel and Vernice Ward. Jerry & Sharon Angel (brother of Jim Angel), Monica Beane, Marla Dell, Barb Goodman, Julie Gordy, Betty Griffin, Kelley Kuhn, Don Miller, Leo Miller, Sue Raab, Shannon Sciba, Harold Sherp, Marti Stickel, Kathleen Stout, Matt Vogelzang and Lawrence Young. Note: TheURGENT Prayer List will be updated more often than weekly as needed. 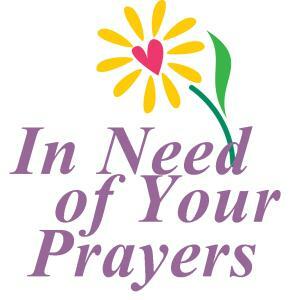 Please check back often for those who need your urgent prayers.